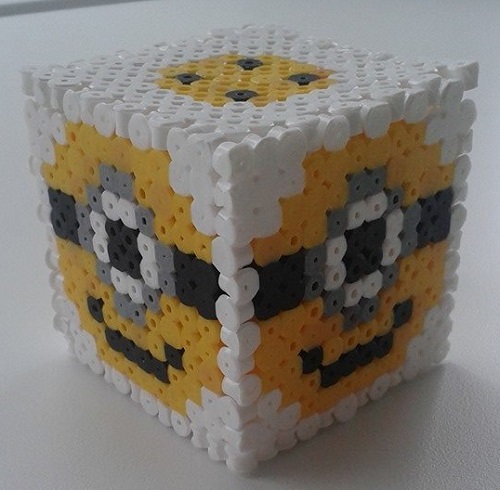 Take making Hama Bead designs to a whole new level with 3D designs. This was provided by one of our new Facebook followers – Thank you! 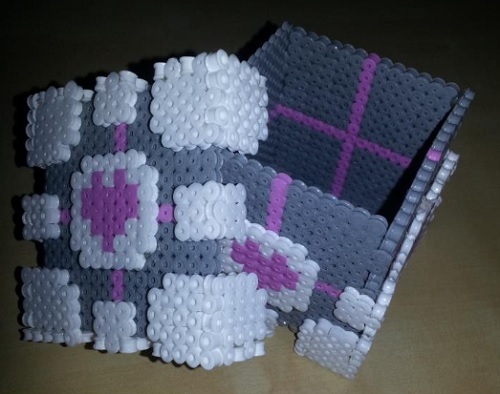 What you require to make Companion Cube out of Hama Beads. Colours required – Here is a list of the colours you will require to make this Companion Cude Pattern and the part number of the individual coloured packs. Make a 3D Heart for the one you love! 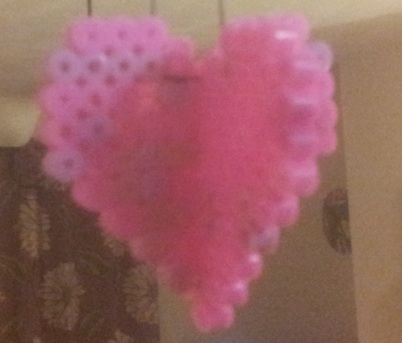 This year, tell the one you love how much they mean to you with a Hama Bead 3D Heart. It’s simple to do and looks great hanging from your car window, the ceiling or anywhere you can see it! This is ours hanging in the living room. What you require to make this 3D Heart design. Colours required – For this design, we have used a variety of pinks. You can make your 3D Heart out of anything you fancy. Tips – Below we have provided 2 illustrations on how this was made. We started off by creating 2 identical heart shapes. You can create as big as you like, but make sure that the width is an uneven number. 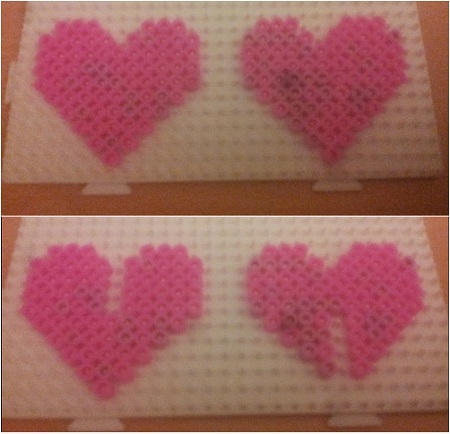 We the removed 3 beads from the top centre of one heart and 5 from the bottom of the second heart. Now iron the patterns to harden. Remember we suggest you do both sides for added strength. Once this has cooled down you can slide one over the other to create the 3D effect. To hang simply thread some cotton through the holes and tie. If you would like to use some fancy fabrics to hang the heart you can do so. You may find that it is too thick to slide through a hama bead – in this instance remove 2 beads from the shape that will slide upwards (i.e. the bottom left heart). If you do the shape that slides down, you will find the bottom may keep sliding down. 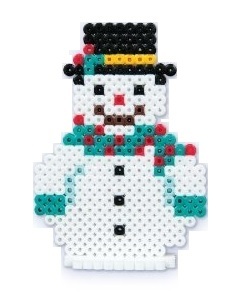 This brand new standing snowman hama design would make a great decoration for the mantel peice or perhaps your desk at work. It’s so simple to make, just make sure you have a lot of white beads. Why not make yours unique by experimenting with the colours you use for the scarf and gloves. Making the stand/base – When you make the Snowman, you need to ensure that the bottom is not a straight edge. You need the bottom to be like uneven teeth as these need to fix into holes in the base. The stand/base can be as large as you like, all you need to do is ensure the holes align to the snowman. What you require to make this Standing Snowman design. Colours required – Here is a list of the colours you will require to make this Snowman Pattern and the part number of the individual coloured (1,000) packs. The 3D Christmas tree looks good enough to be a decoration! If you are a little more adventurous then this 3D Christmas Tree could be right up you street. Please find below a step by step guide to help you achieve it. Take the standard Christmas tree design and remove a few of the current beads as per the 1st image. Next you need to make the extra sides of the tree. Use the image below to show where the pegs need to be to give the strength needed. Once you have ironed on both sides, let it set and gently slot the pegs in the holes. You now have a beautiful 3D tree. What you require to make a 3D Hama Bead Christmas Tree.